A compact, lightweight system designed for short duration meter maintenance and repair. Provides a non-interrupted supply of natural gas to the building during fitting renewal or meter change out procedures. Customer stays on while work is complete. Easy to use, little training needed. Compatible with Grunsky Bag by-pass system or as a direct replacement. 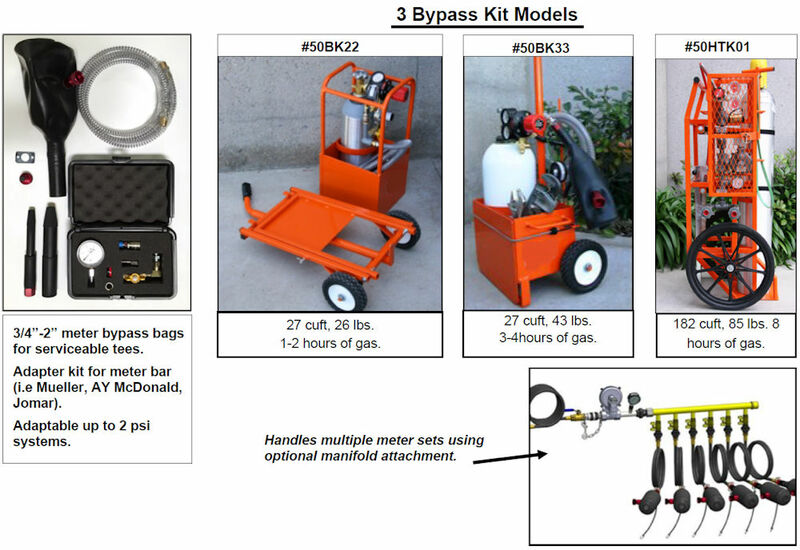 Works on bypass meter bars and other bypass methods. Advanced regulator in system incorporates integral pressure relief valve for added safety. Carrying box designed for use with accessory folding cart for easy transport to and from meter. Tubular steel construction for light weight and strength. System protects gauges and components from damage while remaining visible to operator. Powder coated OSHA Safety Orange for high visibility.